US Role Playing What's Hot #17! Join over 100,000 players in Valkyrie combat and smash your way through hordes of evil minions in this epic fantasy adventure! • NOT A "FREE-IUM" GAME! The stronghold of the Valkyries has been breached, unrelenting forces of Dratok pour in from every corner! The light of the Valkyries grows dim. Can you - the mighty Commander of the Valkyries defeat this tide of darkness? Amidst the chaos, the Valkyrie Maidens are ambushed and taken by Dratok. Only one Valkyrie is left behind - stripped of power by dark magic, you must lead this Valkyrie on an epic adventure to restore her might and save the her sisters. Get CHAMPION Gear when Game Center friends play VALKYRIE GAUNTLET 2 online. Claim CHAMPION Gear from the in-game Shop and start owning! ALL THESE AND MORE FOR FREE! • Over 200 weapons, shields, armor and trinkets to collect and dispose your foes with. • Over 500 dungeon rooms to battle through. 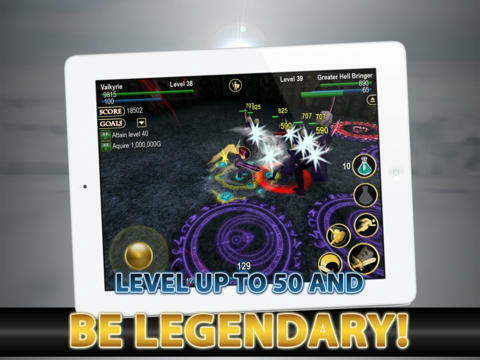 • Train your Valkyrie through 50 levels - get IMBA! • 92 Achievements to gain. • Play anyway you want! Choose strength, intellect, dexterity or a mix build for your Valkyrie. • Experience the ultimate test of skill and tenacity when you unlock Infinity Gauntlet! • FightPro combat system makes you battle like a boss. • Immersive fantasy music score and soundtrack. • Slash© game engine allows you to battle in full 3D with silky smooth battle animation and effects. • Hours of fun-filled adrenaline action at your fingertips. Thank you for playing Valkyrie Gauntlet 2 - The Massively Hack and Slash Game!